A range of preformed, self supporting, unleaded, moulded dpc cavity trays for use at stepped and staggered pitched roof gable abutments. Catchment trays: For building in at the bottom of a slope to catch water and direct it to the outside of a masonry wall via weepholes. Intermediate trays: Available in either hand and built in at each course over the length of the abutment rake. Ridge tray: Used to straddle a roof ridge abutment. External angles: Used in place of unleaded catchment trays when commencing laying from the corner of a building. Internal angles should commencement be from an internal masonry corner. No attached lead flashing; allows for in situ fitment of flashings at an appropriate time in the construction sequence. 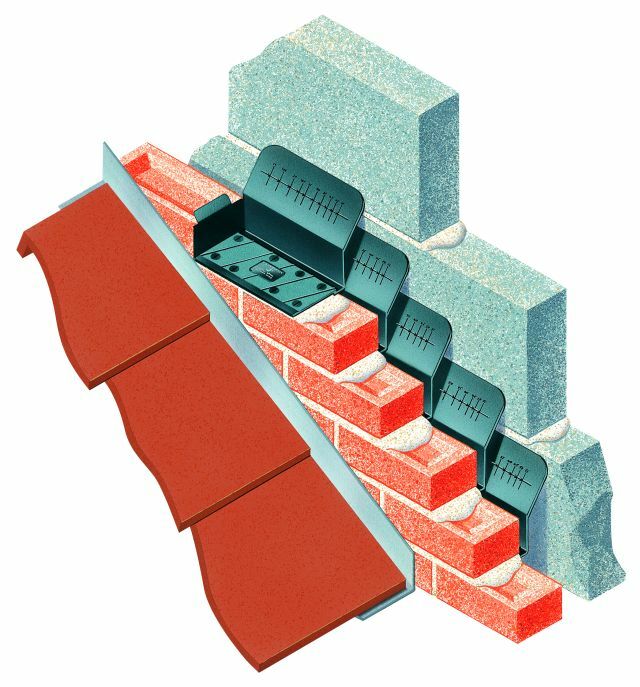 Designed to suit standard 75 mm high brickwork courses. Variable cavity upstand to accommodate a wide range of cavity widths. Optional polystyrene strips to aid insertion and fixing of flashing. Standard trays are 330 mm long, and can be used for roof pitches of 15° upwards. Black, injection moulded solid dpc. Trays suit cavities 50–140 mm wide. An optional polystyrene strip can be included as an attachment to the bed course element of the tray After the tray is built in, the strip can be raked out to provide a void into which a flashing can be terminated and secured. Available in a range of profiles; a selection is illustrated in technical literature. Cavity Trays Ltd can advise on requirements and submit recommendations.